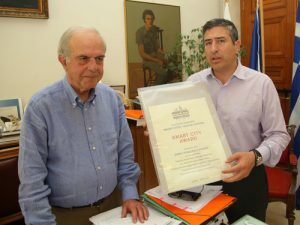 Heraklion Municipality receives the "Smart City Award"
A great distinction was received on Tuesday 23 May 2017 by the Municipality of Heraklion. 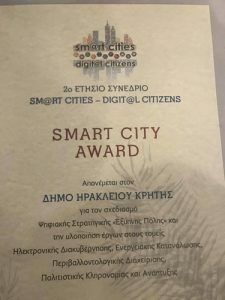 In particular, the “Smart City Award” was awarded to the Municipality of Heraklion, in the context of the 2nd Annual Meeting “Sm @ rt Cities – Digit @ l Citizens” held in Athens. The award was given to the Municipality of Heraklion for the design of a digital strategy “Smart City” and the implementation of projects in the fields of eGovernment, Energy Consumption, Environmental Management, Cultural Heritage and Development. In Athens for the 2nd Annual Conference “Sm @ rt Cities – Digit @ l Citizens” Heraklion Municipality was represented by Deputy Mayor of Programming and e-Government Mr. Petros Iniotakis . As the Vice Mayor pointed out, Heraklion and its citizens have proved to be able to innovate and improve their city. This is why for many years the city of Heraklion has developed a Smart City Strategy to become more competitive at a national and European level. In this context, and through the continuous operation of the Smart City Commission, actions are planned and implemented which serve the main axes of the “smart activity” of the Municipality of Heraklion, which are: Energy and Environment, Sustainable Mobility and Transport, Open Intelligent Governance, Broadband Infrastructure, Interventions in the local economy with the Center for Democratic Dialogue, Innovation and Entrepreneurship with the title “DEMOCRACY”, Citizenship Participation, Smart Living and Improving the quality of life. 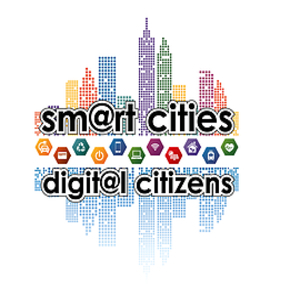 The 2nd Annual “Smart Cities – Digital Citizens” Conference was organized under the auspices of the Ministries of Administrative Reconstruction, Tourism, Environment and Energy, the Attica and Thessaly Regions and the “Information Society” SA. The Minister of Shipping and Island Policy, Mr. Panagiotis Kourouplis, the Minister of Tourism Mrs. Elena Kountoura, the President of KEDE Mr. George Patoulis, the Regional Governor of Attica Mrs. Rena Dourou, the Regional Governors, Deputy Chiefs, Mayors, Deputy Mayors, Chambers of Representatives, officers Bodies and services of Local and Regional Authorities and executives of companies active in the field of Urban Development. Within the framework of the Conference, the following distinctions were awarded: “Honored Region” to the Attica Region, “Honored City” to the Municipality of Trikkaion, “Smart Cities Awards” to the Municipality of Heraklion Crete and the “Digital Citizens Excellences” to the Municipality of Lamia.